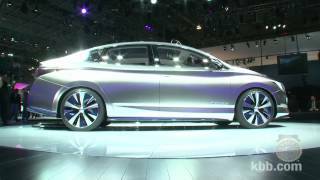 During this year's New York Auto Show Infiniti revealed the Infiniti LE concept, an all-electric vehicle which draws from the Nissan Leaf. 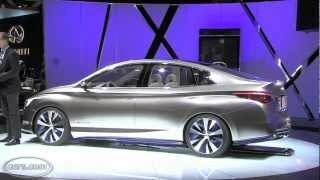 The Infiniti LE concept boasts higher range, more power and as expected from Nissan's luxury division, more comfort, higher quality materials and overall a more luxurious hybrid when compared to the Leaf. The Infiniti LE packs a 100 kilowatt synchronous electric motor which will be paired with a laminated 100 KWh lithium-ion battery consisting in 192 cells. The entire package is expected to produce 134 horsepower and 240 lb-ft of torque which is a notable step up compared to the 107 horsepower and 207 lb-ft of torque developed by the Nissan Leaf. The range has also been improved and the Infiniti LE will presumably be able to cover 100 miles on battery alone, roughly 28 miles more than what you would get from a Nissan Leaf. However, one of the biggest innovations –or selling point- is the fact that the Infiniti LE features wireless charging capabilities. The wireless charging system consists in a coil which draws electricity by wire and is encased on the garage floor. The garage floor coil creates a magnetic field that excites electric current in the second coil which is to be found inside the Infiniti LE concept. This is a neat concept but at first glance it might not look as if it's of much use when you realize that your Infiniti LE will still be in your garage while charging and you might as well use the conventional charging methods. On second thought however, the wireless charging technology might be the solution for solving the "range anxiety" problem in the future, if and when the technology will be made available in parking lots. 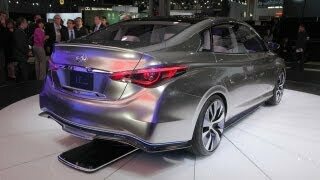 As far as the exterior design goes the Infiniti LE concept features a double-arch grille, aerodynamic front and rear bumpers, side spoilers enriched Infiniti EV Blue illumination, LED head and taillights as well as a few chrome touches. Furthermore the Infiniti LE sports a set of 19 inch wheels and a set of 225/40/R19 tires that improve range. 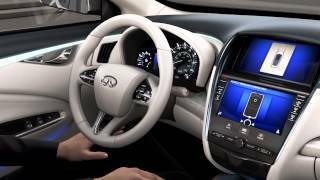 The interior of the Infiniti LE Concept sports a double-wave layout enriched by Infiniti EV Blue lighting, Infiniti EV meters and a twin display telematics and infotainment system powered by Intel. 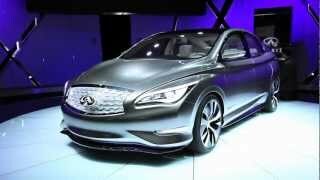 The Infiniti LE is expected to hit the automotive market in 2014 so information concerning its price has not been revealed just yet. While the Infiniti LE might not turn out to be a competitor for the Tesla Model S, the all-electric Renault Fluence might suffer.